I ran into some superheroes in the parking lot this week. Yes, it’s Blossom, Bubbles, and Buttercup, better known as the Powerpuff Girls! Painted on a car! AWESOME! 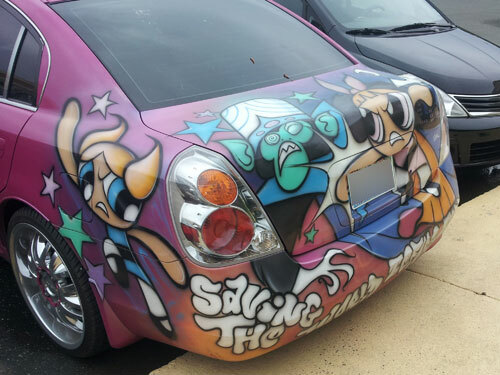 Part of me would like to own a car with something cool painted on the trunk, but another part of me is concerned about resale value. I also don’t think I’d like the attention that is bound to come with a car this distinctive. I like to blend into the crowd and not draw attention to myself. All the better for me to observe you and write about you in my blog later. Anyway, cool car! I will be back with more entries soon, including a book review that I was supposed to publish last month but didn’t because I have evidently become an unreliable person who does not keep her word. I really hate being that person. Trying to do better. I swear. We can’t all be the Powerpuff Girls. Very glad to hear from you. Thought you got buried in pollen. @Vickie – No, I got buried in work and life stuff. Starting to dig my way out. Thanks for checking in on me! Not really, but I’ve gotten a bit behind and buried in work and life stuff lately (and “dropped a few balls”), too. When I’m feeling down and inadequate, It always helps me to know that I’m not alone, that I’m not the only imperfect human out there. 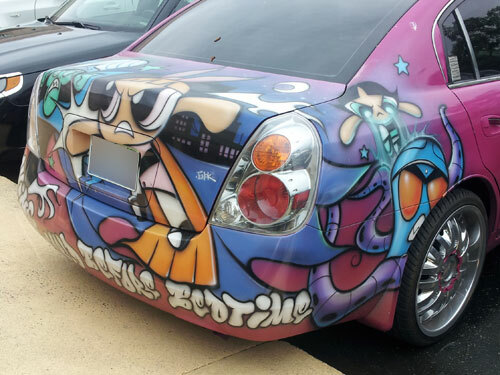 Love the power puff paint job, but I’m with you on having a car that blends in (in case, you know, if someone witnesses me speeding or running a red light, not that that ever happens).